Financial advisors can lose between 80% and 90% of their business when a client dies, according to Financial Planning news. 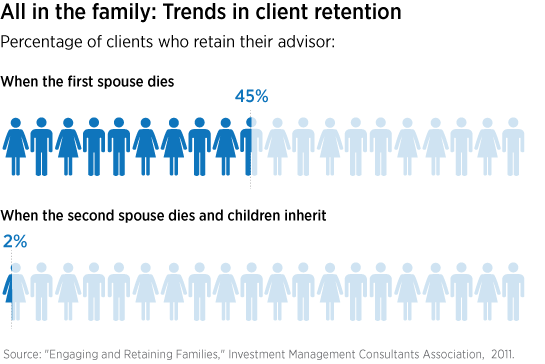 The challenge for advisors is to develop family relationships in order to continue to work with the next generation after a client passes away. There can be obstacles, such as geographic proximity, that make it unlikely that heirs will continue a business relationship. But there are ways to establish a foothold and nurture a longer-term relationship with family members before an event happens. Here are six opportunities for planning discussions that involve family members. 1. College savings. Introducing a discussion around funding education for grandchildren with a 529 college savings plan could get the entire family involved. It’s also an opportunity to build a relationship with the adult children of your older clients. 3. Opportunities to shift income. With the increase in tax rates, tax-smart strategies are more important than ever. Some tax strategies involve multiple generations. With a zero capital gains tax rate for the two lower tax brackets, clients looking to make a gift to children may consider appreciated stock or a mutual fund so the child could sell the asset with no capital gains tax. Or clients may gift an income-producing asset, which would be taxed at a lower marginal tax rate. 4. Installment sales. Families can use installment sales to transfer property from one member to another, spread out payments from the buyer over a number of years, and defer taxes due for the seller. 5. Estate planning documents. Review estate planning documents with clients, including wills, powers of attorney, health-care directives, and revocable trusts. Ask your clients to include their adult children in the conversation. This will help establish your position as the “quarterback” for the family when an event occurs. 6. Efficient wealth transfer. Clients with more complex needs, such as business owners, can benefit from an advisor who can initiate a conversation around inter-generational wealth transfer. Present strategies include buy-sell agreements and Family Limited Partnerships to business owners. Other high-net-worth clients may be interested in Dynasty Trusts or planning for liquidity by using life insurance. Financial planning discussions often involve the impact of the client’s goals on other family members. As advisors establish themselves as trusted professionals who can advise the entire family, they can strengthen the likelihood that heirs will maintain that relationship.